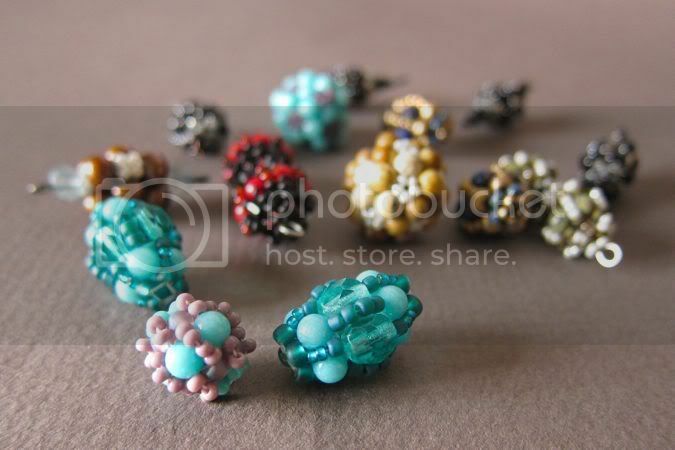 I was recently thrilled to win a glorious grouping of beautiful beaded pulls from La Bella Joya. Aren't they pretty? 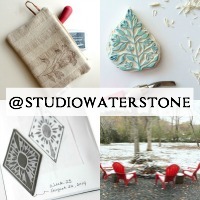 I can't wait to play with these babies and add them to a few Studio Waterstone Clutches. Thank you so much, Marcie. So, so ready for Thanksgiving week! We've got company coming in and I'm looking forward to time off with friends and family. Mr. Waterstone creates the majority of our meal but Wes has volunteered to make the pumpkin pie and, believe it or not, a delicious looking brussels sprouts recipe he's found. Jes refuses to eat sweet potato casserole (which we make anyway - hey, it's a dessert disguised as a side dish!) so she's making mashed potatoes. Me? I'll be cooking in the studio right up until Thursday, then I'll eat. It's the least I can do. And until that time, the blogging will go on! Woo Hoo! Time to say, "Happy Thanksgiving to me!" 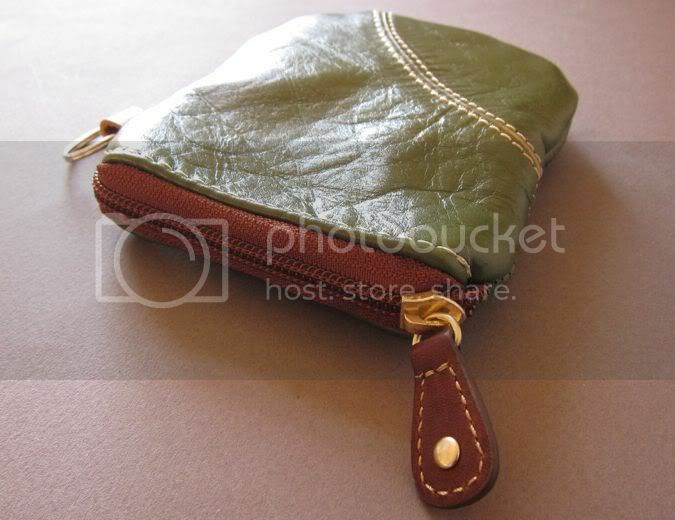 This week I'll be giving away this sweet little recycled green leather pouch/key chain thingy. Tell me. What's your favorite holiday dish? Briefly describe, please. The best sounding dish wins. A team of specialized food reviewers will pour over your comments between now and next Sunday night. On Monday, a winner will be announced. Good luck and let the storytelling begin! best story?? hhhmmmmm.....I will have to think about that. I will be back! My favorite dish is sweet potato casserole but mine is a little different. I mash the potatoes throwing in a zip of cinnamon and then my topping is coconut/pecan/buttery crusty mix. A bite of turkey breast followed by my SPC? Absolute heaven in your mouth! My favorite dish is my aunt's stuffing. I don't like any other stuffing but hers. I don't know how she makes or what she puts in it (and I really don't want to know that part) I just love it! I especially love the corners when it is all crunchy goodness. My cousin and I fight to be the first in line to get the first helping of that stuffing. YUM OH!!! My favorite dish at Thanksgiving is, well two things.. my mom's homemade cornbread dressing and my mom-in-laws potato salad. My mom uses cornbread, eggs, turkey broth and seasonings and makes the best dressing. The potato salad is made with purple onions, mustard and eggs,,all the family loves her potato salad. Aw! Thanks for the shout out! My Thanksgiving Story? P-U-M-P-K-I-N P-I-E. There are probably other things that happen at Thanksgiving, but I'm waay to busy standing around the desert table with my arms stretched out like a baller playin' center tryin' to block a shot. (The shot just happens to be the little triangle serve-thingy headed for my pie). My favorite is sweet potato casserole. It has eggs, sugar and milk mixed in with the sweet potatoes so it is more like pudding. Then it has a brown sugar and butter topping. Yumm! Tom the turkey, of course! I use an apple spice brine and then cook him stuffed with apples and oranges. He is so sweet and juicy. Makes for great tasting gravy too! This is the one day I don't mind cooking. And really what would Thanksgiving dinner be with no Tom? Maple and orange glazed turkey roast baked on a bed of apples and fennel. my family has pretty standard holiday food fare, so I think my favourite "dish" is actually probably my grandma's shortbread cookies. they're really flaky and tender and melt in your mouth. the melting is likely due to the whole pound (!!!) of butter in the recipe (4 cups flour, 1 cup icing sugar, 1 pound butter, that's it). for actual food, my dad makes delicious quiche on christmas mornings, with broccoli, bacon and onions. not a thanksgiving dish, but our thanksgiving was last month so this is the closest I've got. you have to check out this YouTube video (Turkey for Thanksgiving) to "hear" my answer! mine is always the sweet potatoes. Whether they are all mashed together or baked separately, they MUST have mini marshmallows, butter, some brown sugar, and pecans. MMM MMM Good! Green bean casserole. Nothing fancy...just the regular, straight-up green bean casserole. Oh....but with lots and LOTS of fried onion topping. Because that's the schiznicks!!!! This is so yummy. I've made it several years in a row, now. Italian Chard stuffing. You use french bread, Italian sausage, and Swiss chard. Or rainbow chard if swiss isn't available. I'm also thinking spinach might also be good. OK, now I'm distracting myself. Back to the recipe. It has the usual suspects: onion, celery, etc. But the extra yummy (secret?) ingredient is parmesan cheese. This is so dang good! And you can make it the night before! Did I say it was yummy?